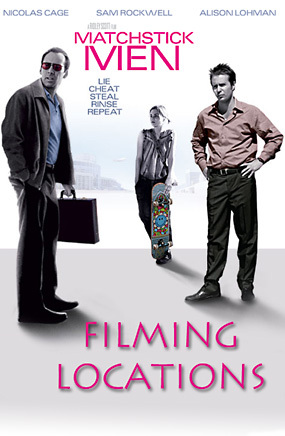 the 2003 Nicolas Cage movie "Matchstick Men" was filmed. Roy teaches Angela her first con, which involves a lotto scam. Their first stop is a convenience store, where they buy a lotto ticket with the same numbers as the previous winning drawing - minus one. That store is actually Joe's Liquor, at 12701 Washington Place, Los Angeles. That's in a small strip mall at the northwest corner of Washington Place & Wade Street, about mid-way between the park in Culver City and the laundromat in Venice. That's also just a few blocks southeast of Angela's high school, and just about a half a mile south of Roy's house. The residential homes, seen across the street from the store, are on the south side of W. Washington Blvd (not Place), near the southwest corner of Washington Blvd & Wade Street. The second part of the scam takes place in a laundromat. They fake the date on the lotto ticket (to make it look like it's from a previous drawing), and then lure a woman in the laundromat into thinking it's valuable, eventually bilking her into giving Angela half of the "winnings". This scene was shot at the former Supersuds Laundry, that was located at 1419 Main Street, in Venice, CA, at the northwest corner of Main & Market Street. Unfortunately, that laundromat has been torn down, and is being replaced by what appears to be an apartment house. Roy picks up Angela after school. The school seen in the scene is none other than Venice High School, at 13000 Venice Blvd, in Venice, CA. Venice High has appeared in a number of movies, most notably "Grease". Then it's on to the bowling alley, where Roy embarrasses himself my rolling a gutter ball. 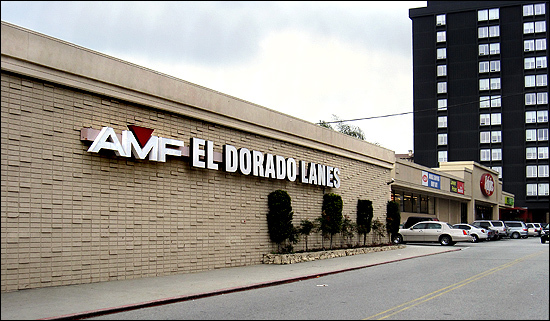 The bowling alley in these scenes is AMF El Dorado Lanes, at 8731 Lincoln Blvd., in Westchester, just north of LAX. The bowling alley is literally next door to the diner seen earlier in the film. After Roy takes Angela into his bank for the first time, we see them walk out to their car, which is parked on the roof of a parking building in a downtown area. That parking garage is located at 815 8th Street, in downtown L.A. (between Hill & Olive). That's just north of Washington Mutual Bank. The camera is looking north. In the background, you can see the top of One Wilshire tower, which is located at 624 S. Grand Ave, two long blocks north of the parking garage, but just a stone's throw from the actual bank location. The sting finally goes down at the airport., where they meet the mark again for the final currency swap. But ignore that fake plane added the skies of the photo above. It's not LAX, as you might think. They couldn't film at the airport, so instead, they looked for a spot they could pass off as the airport. They wound up shooting those airport scenes across the street from Disneyland, at the Anaheim Convention Center (at 800 W. Katella Ave, in Anaheim). All they really needed were a few airport signs. This isn't the first time the Anaheim Convention Center stood in for LAX. They also used it for the 2003 thriller, "Cellular". After the airport sting goes down, Roy, Frank & Angela meet (in their cars) in a huge deserted parking lot atop a hill (with the skyline of downtown L.A. visible in the background), where they argue about Angela's arrest record. This scene was shot in the parking lot of Dodger Stadium (north of downtown), at 1000 Elysian Park Ave.
Roy discovers that he has run out of his pills and goes into a panic. He rushes to the drug store to get more of them, where (after making a scene) he learns that the pills are simply placebos. 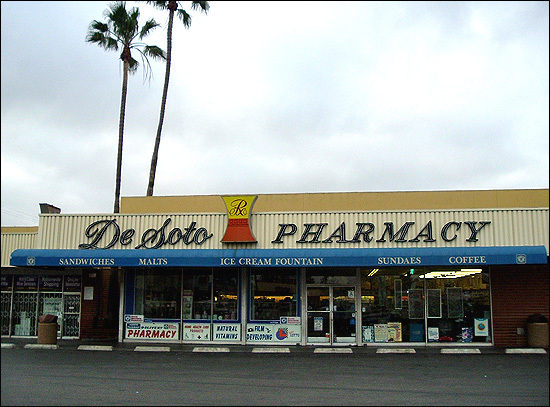 Those drug store scenes, like many in this movie, were shot in the Valley, this time at the De Soto Pharmacy, located at 20914 Roscoe Blvd, in Canoga Park. That's about 2 1/2 miles east/northeast of the supermarket. Roy wakes up in the hospital, and later escapes out onto its roof-top parking lot, where the Los Angeles skyline is visible in the background. That parking lot is really the roof of the Grand Avenue Garage, located at 1601 S. Olive Street, in Los Angeles. When Nicolas looks out towards downtown, he's looking north/northeast. But it's a bit farther south of those downtown skyscrapers than it seems. It's about a mile southwest of those buildings, and just north of the Santa Monica (10) Freeway - a few blocks east of the L.A. Convention Center. The building is bounded by Venice Blvd (on the north), W. 17th St. (on the south), S. Grand Ave. (on the west) and S. Olive St. (on the east). The subsequent street scene, where he hails a cab, was filmed right outside the building, on its west/northwest side, near the corner of 17th Street & Grand. The carpet store, where Roy and Angela meet again, was known as Carpeteria at the time the film was shot; it is now L&S Carpets, located at 7007 Laurel Canyon Blvd, in North Hollywood. That's about 4 1/2 miles northwest of Universal Studios Hollywood, less than a mile west of the car wash, and less than two miles west of the psychiatrist's office. Some of the photos on this page are stills from the DVD of "Matchstick Men"